Jubei is a masterless ninja who travels the land alone, hiring his services to those with gold... or a worthy cause. His farsome abilities have served him well, but a hideous plot to overthrow the government threatens to end his wandering ways and possibly his life. When a small village succumbs to a terrible plague, a team of ninjas are sent to investigate and realise that all is not as it seems. Ambushed, they are wiped out by a fearsome man-monster with incredible powers, leaving only one alive - Kagero, a beautiful female ninja who touch can bring instant death. 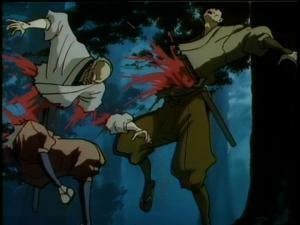 Jubei saves her from a fate worse than death and unwittingly becomes drawn into a web of treachery. 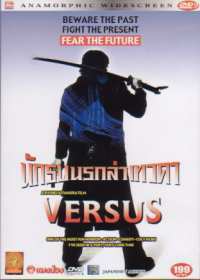 He is soon faced with his greatest challenge, an enemy for who death holds fear with the power to destroy Jubei's world. After rewatching Spirited Away in the cinema recently, I found myself in an animated film inspired mood. With that desire in hand I decided to watch one of the several Manga films which were sitting on my DVD shelf. 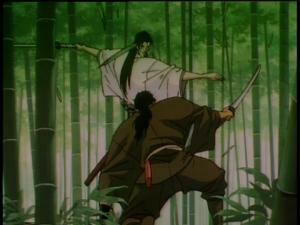 Not knowning which would be the best one to watch for a Manga novice, I randomly chose Ninja Scroll. As stated in other places, I freely admit that I am an animated film novice. This is good and bad I feel for the same reason, I have no preconception as to what to expect, I only have hopes before the film. The story behind Ninja Scroll is actually reasonably good, and in that area I was pleasantly surprised. A small village is wiped out, apparently by a plague of some sort, and a team of ninjas from the Koga clan are sent to investigate what happened to them. On route to the village, they are all killed by a demon called Tessai, except for Kagero, the only female ninja from the Koga clan. She, however, is rescued by Jubei, a masterless ninja who hires his services out. 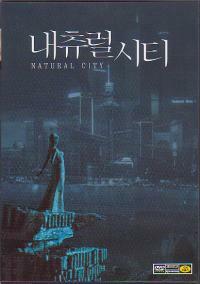 As a result of his encounter with Tessai, he comes to the attention of Dakuan, a government spy who is on a mission to uncover, and foil, a plot to otherthrow the government. 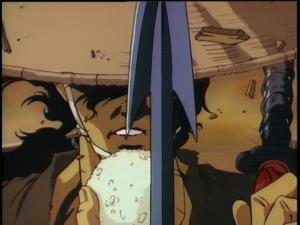 He forcebly recruits Jubei into his mission, and uses his talents to their best. As they discover more about the scale of the plot to overthrow the government, Jubei makes alarming discoveries about the man behind the plan - a man he believed he had killed years previously. In trying to write a summary of the story, I realised how intricate and complicated it actually is. What I've written summarises the main plot, but there are quite a few sub-plots which actually hold just about as much weight as the main plot itself. If I tried to write about them as well, it would become a jumbled mess. However, in the film this is not the case. The sub-plots all merge and mix very well, despite all that is going on. On the whole, I did enjoy the story, as it was well done. My only significant complaint as far as the film is concerned was that there were too many characters introduced without much development, most of which were killed off rather quickly or abruptly. That's my only real complaint though. The animation took a little while to get used to, I have to admit. I was expecting something along the lines of Spirited Away in terms of attention to detail, but Ninja Scroll does not come close. Background detail is relatively minor by comparison, and no scene seems as full of life as the Studio Ghibli film. The animation itself was alright. It was a little jerky for my liking at times, but this was most noticable early in the film, as once the film progressed I gradually got used to it. Another minor complaint, although I'd take this with a pinch of salt as I cannot remember if it was this film or another animated feature I watched recently, was that in some scenes there was no animation at all, just scrolling over an image, with something like a flashing background. As far as the animators are concerned this is undoubtedly easier than animating a character, and can give the illusion of animation, but I didn't like it. The only other Manga film which I can remember seeing in the past was Akira and in it there was plenty of bloodshed. 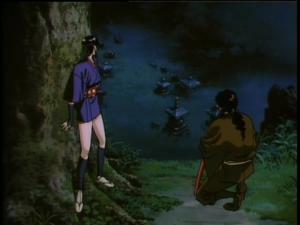 Ninja Scroll isn't really that much different. There are quite a few scenes where people are decapitated, severed in two or cut up in such a way that blood is inevitable. This is an area in which animated films have much more scope than live action, you can draw anything happening to someone, and make it as gory as you want. The action scenes themselves are quite fast paced, with quick editting, and are alright to watch. 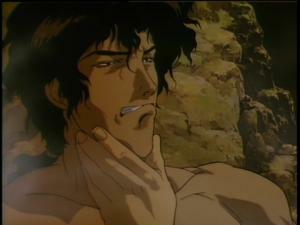 I really don't know what else to say about Ninja Scroll. It doesn't have the depth that Spirited Away had, it is simply just an action animated film, with a limit on what can be commented on. So with that in mind, I'll bring this review to a close with my short summary. On the whole, most things are good, and the film is reasonably enjoyable. I don't think it has much repeat viewing potential, but for one view it is worth seeing. The audio for Ninja Scroll is available in English or Japanese. Being a Japanese film, I chose to watch it in that language with english subtitles. The vast majority of the sound is the speech coming from the characters. There isn't as much general background sound effects as in the likes of Spirited Away, where every last detail was covered. 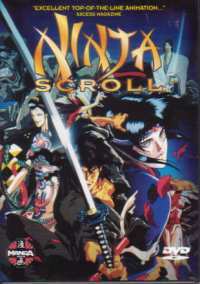 Ninja Scroll is not in the same league in those stakes. However, all the speech and the sound effects that are there, are still clear enough. The Japanese soundtrack is only a stereo track, but still manages to give clear left/right seperation when needed. The english subtitles were pretty decent too with no spelling or grammars errors. However, they could have done with having a thicker black border to each of the letters, as on light backgrounds they were a little hard to read at times. There are also english subs for the hard of hearing, where some sound effects (like people screaming etc.) are written to screen as well. 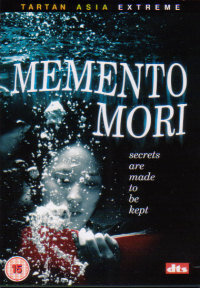 The film is presented in full frame, 4:3 aspect ratio. I don't know if this is the original aspect ratio for the film, but there is one release (that I know of) which has released this film in anamorphic widescreen. One of the two has suffered from cropping! Anyway, the picture is clear enough I guess. The amount of detail on screen is never that great, but that is more to do with the amount that has been drawn in by the animators rather than lack of clarity on the dvd. The scenes certainly never have as much detail to them as the likes of Spirited Away or Princess Mononoke. On some occassions there does appear to be some colour bleeding, as the bright colour spilled over quite a bit from where it was meant to be. There was very little speckling on the print (that I can remember), and I wasn't really aware of much grain to the print either. For extras you've got A Guide to Ninja Scroll, which has a complete film synopsis, or rather a detailed account of the entire film, from start to end. So don't read it before you see the film!! The Guide also has character biographies on 11 of the characters met in the film. Next there is a 4 minute Manga Video Commercial, which features clips from Ninja Scroll, The Guyver series, Wing of Honneamise, Macross Plus, Mad Bull 34 series, Devil Man, Giant Robo, Dangaioh, The Secret Adventures of Tom Thumb and Ghost in the Shell. Next there is the Manga Video Fan Club trailer which just features different titles and other merchandise which is available to buy from the Manga Fan Club. 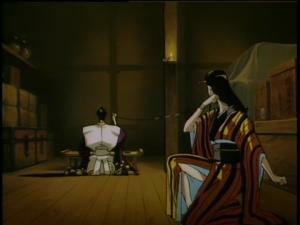 Lastly there is the Ninja Scroll theatrical trailer. So basically nothing much here of substance. I found Ninja Scroll to be a reasonably decent film. Granted some of the animation didn't really do much for me, but the story was decent enough. If handled faithfully I think this could make a good live action film, however I doubt that will ever happen. As far as animated films go, Ninja Scroll is not anywhere near in the same league as Spirited Away, but then comparing the two is a touch unfair. The only thing that they have in common are the fact that they are both animated films. Nothing more. 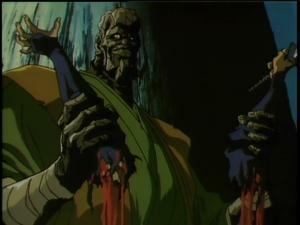 If you are looking for some "a little over the top" violence, then Ninja Scroll does supply. It is a decent story, and ok action.